Depending on the type of work that you do, hydraulic hose assemblies could play a very important part in your day-to-day business. Top quality hydraulic hose services for custom orders and other industrial supply and services is essential for many different industries. At Metro Industrial & Marine Supply, we have a large supply of hydraulic hoses and assemblies to meet the needs of our customers. We also create hoses-while-you-wait to provide custom solutions at our New Bedford shop. We understand the needs of the industries that we serve and strive to provide them with all of the parts, products, and solutions they require. While some customers know exactly what they need to ensure a proper fit and performance for their hydraulic hose assemblies, others may need some assistance. This is particularly true with new equipment or for repair companies who provide their clients with top quality hydraulic hose services. This is when having a large supply of hydraulic hoses can pay off, and that is why so many of our customers come to us from all over the Southeastern Massachusetts region. To select the right hose size and type, the acronym “STAMPED” can be helpful and serve as a reminder of everything that must be considered. “S” stands for the size, which must be measured from both the inside and the outside diameters of the existing hose. It must be done using a precision-engineered caliper. The length of the hose must also be measured to ensure a proper fit. “T” stands for the temperature, as hoses are rated with a maximum working temperature that can range between 200-300 degrees Fahrenheit, which is based on the fluid temperature and not the working environment. Temperature is a significant factor in the life of your hydraulic hose assemblies, as too much exposure to temperatures beyond the rating can cause the hose to lose its flexibility and ultimately lead to failure. External temperatures should also be considered if the hoses will be exposed to a heat source during use. “A” stands for the application of the hose, including the bend radius requirements. This is typically measured in inches and is vital to ensure the integrity of the hose during use, reducing safety issues and providing a longer hose life. If the hose is bent to a tighter degree than recommended, a dangerous failure could occur. Line lengths and hard angle bends should be reduced whenever possible to protect the lines from damage and increase the hose life. “M” stands for materials, which must be checked to ensure that the fluid used in the system will be compatible with the hydraulic hoses purchased from industrial supply and services. High temperatures, contamination, and concentration will impact the compatibility of both the hydraulic hose and the fluid. While most hydraulic hoses are compatible with petroleum-based oils, some of the new environmentally-friendly fluids have been found to cause a problem with some materials. Always check the manufacturer’s recommendations for the hose, fluid, and machinery before using. “P” stands for pressure, which is one of the most critical factors in choosing top quality hydraulic hose services. 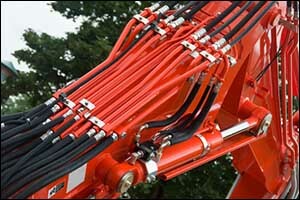 This is why we stock a large supply of hydraulic hoses for our Fall River customers. We know that the pressure can seriously impact the integrity and longevity of the hose. The working pressure must always be considered when purchasing replacement hydraulic hose assemblies to ensure that it does not exceed the maximum system pressure. Pressure spikes also need to be factored in, so it is important to keep a record of the equipment pressure performance when replacing hydraulic hoses. “E” stands for ends, which are also very important in the selection of hydraulic hose assemblies. The coupling-to-hose ends must be compatible with the hose that gets selected at the industrial supply and services shop. Also, the proper mating thread end must be used to ensure that the connection makes a leak-free seal. Most couplings fit into one of two categories, which include a permanent type and a field-attached type. The permanent type is typically used by equipment manufacturers for anything from industrial machinery to agricultural equipment. It is also used by maintenance shops and large-scale rebuilders. The permanent couplings are “cold-formed” onto the hose using machinery and are available for most hoses made from rubber or thermoplastic materials. Field-attached couplings are made “in the field” using portable machines to make quick repairs and replacements. “D” stands for delivery, which refers to how quickly or easily the product can be delivered to the user. Again, this is why Metro Industrial stocks a large supply of hydraulic hoses at our industrial supply and services center in New Bedford. We strive to meet the needs of our customers by providing as many options as possible for standard and custom hydraulic hose assemblies while reducing costly delays due to time lost while waiting for specialty components to be made available. Fall River businesses count on our top quality hydraulic hose services at Metro Industrial. If you are interested in learning more about our while-you-wait custom hose services or would like to purchase hydraulic hose assemblies from our shop, give us a call at 508-996-8400. Since 2001, Metro Industrial & Marine Supply has been a fixture in New Bedford. We have worked hard to earn a solid reputation for providing quality products and services to our customers throughout Southeastern Massachusetts. We sell to individuals, organizations, and corporations locally and internationally.